Zhytomyr State Pedagogical Institute began its 60’s under the environment of first tries to democratize social life of the country. 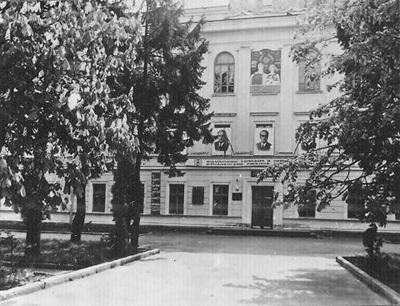 Its highest governing body was the Board of the Institute, but since 1972 it became the Academic Board including Rector, Vice-rector, deans, party and Komsomol secretaries, directors of professors’ and students’ trade union committees, heads of departments, senior professors, and students. From January, 1958, I. F. Osliak, Candidate of Philological Sciences, associate professor, worked as Rector of the Institute; from December, 1973, P. S. Hornostai, Candidate of Pedagogical Sciences, associate professor, was Rector of the Institute; from October, 1986, it was lead by I. M. Kucheruk, Professor. Secondary school changes to new curriculum in 60’s, introduction of oblige public secondary-level education increased pedagogic purpose by far. The main burden of this reorganization fell on Pro-rectors in educational work M. P. Zhurbas, L. M. Kurkchi, and M. M. Osadchyi who carried out these duties since 1977. At the beginning of the 60’s, the Institute qualified pedagogical personnel over two faculties with degrees in eleven specialties for full-time education, and in three for correspondence departments. 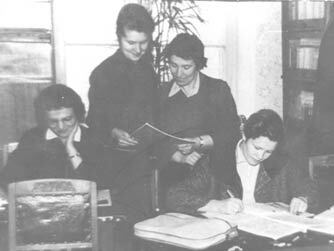 The Faculty of Philology offered opportunities in obtaining a degree in: Ukrainian Language and Literature, Russian Language and Literature, Russian Language and Literature and English Language, Russian Language and Literature and German Language; Russian Language and Literature and Pedagogy for students from Uzbekistan (during 1959–1973); Russian Language and Literature in an ethic school for students from Kazakhstan (in 1971–1993). The Faculty of Physics and Mathematics trained specialists in: Physics and Mathematics, Mathematics and Physics, Physics and English Language, Physics and basic disciplines, Mathematics and Technical Drawing. Correspondence department qualified teachers of Ukrainian Language and Literature, Russian Language and Literature, Mathematics. Over 1944–1971, the department was regarded as a faculty under the department of full-time education. Considering that in the 60’s, 42 per cent of teachers of Zhytomyr region, and then 36 per cent of them in the 70’s, haven’t got higher education, large majority of enrollment of the Institute was extramural students. Complementary to above-mentioned specialties they had opportunities to obtain a degree in English Language and French Language (1963–1972), in Biology (since 1974), and Pedagogy and Primary Education Methods (since 1978). In 1962–1968, the General Scientific Faculty including Department of Humanities and Mathematics worked for extramural students. Students studied to get a degree in History, Library Science, Legal Science, Ukrainian Language and Literature, Russian Language and Literature, English Language, French Language, Mathematics, Physics. Then, students went onto further study obtaining specialties for choice in higher educational institutions of Ukraine under correspondence departments. In 1963, the Faculty of Foreign Languages as a separate faculty was originated under the aegis of the Faculty of Philology. The faculty qualified specialists in English and German Languages, and till 1972 — in French Language. Students from Uzbekistan could obtain degree in English Language as well. The 70’s turned out to become the years of notable increase and diversification of the Institute. 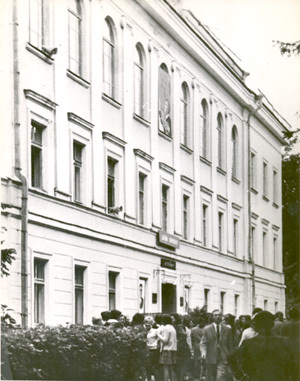 After Berdychiv Pedagogical Institute was discontinued the Faculty of Natural Sciences was transferred to Zhytomyr (1972). The Faculty qualifies teachers of Biology and Chemistry. In 1976, the fifth faculty was originated. This was the Faculty of Primary Education with full-time education and correspondence study. As early as in a year, the Faculty proposed an additional specialty — Music. The number of departments, students, teaching staff, and fellows doubled. Therefore it was necessary to redeploy tutorials into two shifts. In 1979, the Institute won second best among pedagogical institutes for best students’ labor, life and leisure time organization. Hostel № 3 won first prize. M. O. Lukin was superintendent of the Hostel at the time. The Institute was honored for its achievements with diplomas of Republican Trade Union Committees and Ministry of Education of Ukraine. Constant enrollment growth, origination of new faculties and specialties required great regard concerning upgrading of facilities. In 1962, the central campus building was completely reconstructed. In 1979, a shooting gallery and metalworking and processing workshops were built. In 1987, new campus of the Faculty of Foreign Languages was put in commission. During 1972–1981 over an area of 15 hectares, training-laboratory rooms and training-small holdings for agrobiological station were built. In 1988, the overhaul of campus building of the Faculty of Natural Science was over. In 1990, new eight-storey training-laboratory building was erected including its three completions built in 1992. Over 30 years, the area of the Institute expanded fourfold. Students got education in 217 auditoriums, whereof 14 were large attendances. There were constructed 25 special laboratories and 59 studies, whereof most part of them were equipped with training facilities. Students may use five hostels (opened in 1935, 1956, 1972, 1981, 1986); first aid post including consulting and manipulation rooms, dental office, and five isolation wards. There in the hostels 2 thousand students and 82 families lived. In virtue of growing demands of secondary schools for teachers the number of academic teaching staff increased. In 1960, 73 professors worked at 12 departments, whereof 27 professors possessed academic degrees in Candidates of Sciences and academic titles of associate professors. In 1990, 22 departments numbered 289 professors including 10 Doctors, Professors, 114 Candidates of Sciences, associate professors among them. Over the 60’s, about a thousand scientific papers in 1.2 thousand printed sheets gross volume together with 17 volumes of Scientific Notes were issued by the efforts of scholars of the Institute. 84 monographs, 556 text-books and methodology guidelines, 11 collectors of articles and abstracts, 108 brochures, more than 2 thousand articles were published within next 20 years. During 30 years, the Institute’s contribution to progress of scientific thought reached 3,750 scientific papers. Repeatedly, the Institute was a venue for republican, interuniversity, and regional conferences. Thuswise the following republican scientific conferences as on the occasion of 70th and 75th birth of M. T. Rylskyi, 110th and 115th birth of I. Franko, 150th birth of T. H. Shevchenko, 100th birth of M. M. Kotsiubynskyi, 170th anniversary of H.S.Skovoroda’s death, 100th birth of Lesia Ukrainka, and on linguistic and theory of literature matters took place here. Rendering assistance to school became one of the leading Institute’s lines. Since 1970, all the districts of the region were vested in different departments. In the 1970’s, monthly courses of intensive teacher retraining in eight specialties started working. Over 20 years, 14.5 thousands of teachers of the region completed retraining courses. In 1984, Basics of Computer Science and Computer Engineering courses were opened at the Faculty of Physics and Mathematics. Every year more than 400 teachers of Mathematics learned elements of programming and computer system practice. At republican review the Institute won second best for rendering useful assistance to schools (1975). During 1970–1990 alone, 170 text-books and more than 300 methodology instructions were issued for schools. The introduction of oblige public secondary-level education in 60’s set a task to provide schools, training colleges, voluntary schools and technical voluntary schools with teaching personnel. Given that in 1960, enrollment of students was 2.4 thousand people including 760 full-time students and 1.7 thousand of extramural students; in 1970, it reached 1.6 and 1.5 thousand of students correspondingly. In another ten years, the enrollment was 2.4 thousand of full-time students and 1.1 thousand of extramural students. September, 1, 1990, the enrollment of students of the Institute was 2.8 thousand of full-time education students and 1.6 thousand of extramural students. Large numbers of them were medalists, young people living in rural areas. Two thirds of full-time admission was carried out by village school leavers, since 1972. Only popular education members, discharged from the Armed Forces, and graduates from teacher training colleges were enrolled in correspondence study. In 1990, young people of those enrolled for full-time education totaled 50 per cent having target reception. These were graduates of a preparatory department and Zhytomyr Teacher Training College. Professional skills of graduates shaped due to proficient teaching practice organization. The following kinds of teaching practice were introduced into students training system concerning scientific-educational work: socio-political practice, on-academic teaching practice for students of 1st and 2d courses, teaching practice in Pioneer camps, practice a profession at teaching squads, occupational practice for students of the 4th course in out-of-school educational activity on-job, teaching practice in schools of Zhytomyr and of the region. Since 1977, practice for students of 1st-5th course under schools gave an opportunity to turn teaching practice into continuous one. Students of the Faculty of Initial Teacher Training undertook their practice over a period of three years leading the same class. Before their school practice, students of the mentioned faculty and the Faculty of Natural Sciences undertook field practice at the agrobiological station of the Institute. Great attention concerning this part of work was affirmative. Yearly, 60–62 per cent of students passed teaching practice with an excellent mark, and up to 35 per cent of trainees got ‘good’ mark. Expeditions through places of military and labor Glory, subscription concerts for orphans, roads of charity to Denyshiv Orphan Asylum, carrying of Memory watches and The Soldier’s Letter Campaign, leadership of youth, mathematic, physical, and astronomic schools, together with literary studio for children, medical plants collection, overhaul of Partisan Fame hall in the village of Kopyshchi and the like — all these totaled students’ useful activities. During the third working semester, 282 construction brigades worked on new ground in Krym, Mykolaiv, Kherson, Kyiv, Tiumen, Orlov, and Mahadan regions. They implemented 21 million roubles (measuring in prices of 1990) of capital investments, reconstructed 51 schools, including 5 built, built up 128 playgrounds, 78 classrooms. Amateur talent groups were high on the list of young students training. Yateriv folk song choir directed by M. O. Nykorchuk, and Suzir’ia dancing company directed by V. O. Svitelskyi became widely known across the region and outside and got title the People’s (1987). Kalyna folk music group directed by P. I. Antonevskyi and Elehia vocal group directed by V. V. Sychevska got this title as well. A multipronged approach concerning educational and research work in the intelligence-orientated abilities of future specialists was an earnest of all the solutions whereof the staff of the Institute found in the years 1960–1980. New quantitative and qualitative changes, new ascents and workouts were to come onwards. Preceding 70 years of work were the basis for those implementations.